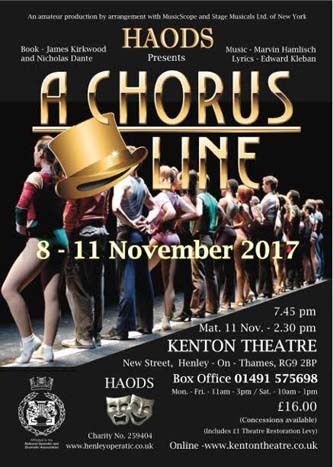 A packed audience at the Kenton Theatre was transported to Broadway on Wednesday night for the opening show of Henley Amateur Operatic & Dramatic Society’s (HAODS) latest production of the record smashing musical A Chorus Line. There was much anticipation from Kenton regulars to welcome back the successful artistic direction team of Lloyd White and Emma-Jane Taylor, with Amy Bingham joining as Musical Director. The opening silent sequence heightened the suspense before the full company burst into energetic song and dance. Every member of the 21 strong cast delivered 100% in vocals and dance with each actor immersed in their character from the moment they arrived on stage and turned to face the lights. The breathy desperation in “I Hope I Get It” portrayed by Henley dancing diva Steph Maxwell gave an early clue to the passionate energy we would be treated to for the 90 minutes ahead. From the opening company numbers it was clear that the ensemble were a talented whole, and there were stand out performances early on: Richard Bott entertained as Mike with a seamless and dynamic solo, Claire Wallis’s strong vocals and acting skills are showcased in “At the Ballet”, in good company with Georgia Waring and Kym Leyendeckers, whose portrayal of the outwardly brash Sheila was uncomfortably powerful while hinting at buried insecurities. The full company performance of “Hello Twelve, Hello Thirteen, Hello Love” was impressive in its slick and complex delivery; the attention to detail and quality a result of dedicated hard work from all. Each member of the hopeful line-up reveals poignant episodes from their life journey, many comic and resonant and some harrowing in their searing honesty. Tom Chapple’s extended monologue left the auditorium holding their breath as his character’s emotional revelations unfolded. Spontaneous applause from the audience was well-deserved for the convincing intensity of his performance. Vanessa Clayton’s skill for voice work and acting was matched by her outstanding singing with a convincing and comic delivery of Diana’s solo “Nothing” and a powerful “What I did for Love”. Several of the numbers in the musical score are technically complex and the cast handled this with professional skill and talent. Katie Healy performed the signature tune “Dance 10, Looks 3” with confidence and style maintained throughout the demanding number. Liz Bamford oozed golden age glamour and cool expertise as the ever watchful Loni, but of course praise for the superb choreography goes to Emma-Jane Taylor. The show captivated the audience for the duration and the camaraderie and fun was infectious; HAODS can expect to see new recruits lining up to audition for their next show as who wouldn’t want to have a piece of the showbiz they bring to town? There are still tickets available for the remaining shows so grab some friends and go along for a fabulous night out!